Nana Addo in a handshake with the late Samuel Nuamah’s father. 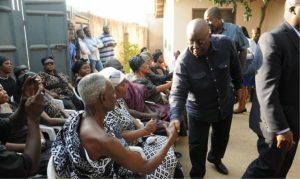 The 2016 presidential candidate of the New Patriotic Party, Nana Addo Dankwa Akufo-Addo, on Monday, August 24, visited the family of the late Samuel Nuamah, the Ghanaian Times reporter who was killed in an accident involving the presidential press corps last Thursday. 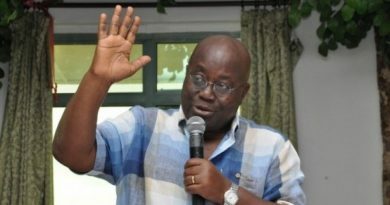 Accompanied by his running mate, Dr. Mahamudu Bawumia, NPP’s director of communications, Nana Akomea, NPP Youth Organiser, Sammy Awuku, Mike Oquaye Jnr and Maame Afua Akoto, both NPP deputy directors of communication, Nana Akufo-Addo extended his condolences, and also the condolences of the NPP to the family. “I am here today to offer my sympathies to you on the loss of your son, Samuel Nuamah. In this life, we all hope and pray that no parent should have to bury the child. But when such a tragedy befalls, as is the case of Samuel, we have to leave the matter with God. It is painful, but God, in His infinite wisdom, knows why he decided to call Samuel into his bosom at such a young age,” he said. 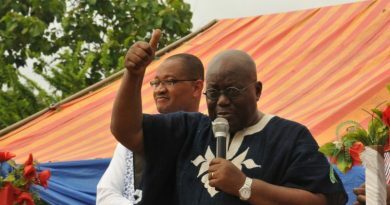 Nana Akufo-Addo noted that the late Samuel Nuamah’s job as a journalist meant that he was not only working to take care of his family, but was also working for mother Ghana. Thus, his passing represented a loss for Ghana. The NPP flagbearer asked the family to keep him informed about the dates for the final funeral rites of the late Samuel Nuamah, adding that the NPP would be well represented at the ceremony.